The past few posts have showcased some problems facing Serbia and now I will lighten the mood with my favorite Japanese director: Hayao Miyazaki! CK has film screenings three times a month that fall under one category, and since it was my turn to choose the topic, I picked the three Miyazaki movies we could find with Serbian subtitles. This ties into another dramatic difference between America and Serbia: while they both have copyright laws, Serbia does not enforce them whatsoever. On my first night in the homestay, my family told me about the films and tv shows they owned and it was quite a selection (every episode of Friends, a dozen or so Serbian or Balkan films, at least a third of the total Disney film library). After doing some searching for this dvd or vhs collection, my tata laughed and led me to their family computer, opened a few folders, and there they were. Everything they said they owned downloaded (what I consider illegally) from various pirated databases. He continued his explanation saying that most of them were downloaded by his friends and passed along to him since the internet in our neighborhood is very weak. They have put the majority of the movies and tv shows onto discs so they don't have to stare at the computer screen to watch them but I was quite shocked that this was the practice by every individual in Serbia. Anywho this is the practice used to get movies to the youth viewers at CK, so the film selection depends on which Serbian subtitles can be downloaded and in my film choices Kiki's Delivery Service drew the short stick for lack of pre-existing subtitles. 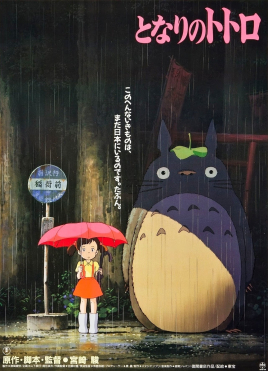 This week we showed Totoro, next week is Castles in the Sky, and the last week is Spirited Away. Personally the first, third, and Kiki's are my favorites and so I'm glad that I get to show them twelve time zones from where they were shown to me. Going into this week I was ever so hesitant about the turn-out for Totoro. The Serbian young people I'd talked to prior hadn't heard of it and when it was attached to manga animation some seemed less interested. But to my great surprise every seat was filled and about ten or twelve people were sitting on the floor! I sat in the back by the technician so I could try to assist if anything were to go wrong though my assistance would hardly alleviate the problem but this view allowed me to see the whole audience and their reactions. And they loved it! There were constant giggles and "awwwws" throughout and for those of you who are familiar with it, when the town was searching for Mei without success I noticed some sniffles coming from the audience. When the last measures of the Totoro closing titles song were versed and the lights switched on, the room was buzzing with pleasure and as people exited many asked when the next one was and said they would definitely attend! I'd like to think that I have brought this art form to Serbia and spread joy through Miyazaki's genius, but regardless, this screening was a success and hopefully the two to follow will continue this trend.